Many members within the Pennsylvania Athletic Trainers’ Society (PATS) recently had unique ways to promote the profession of Athletic Training and also educate the community about concerning topics within the realm of Sports Medicine. Traveling to GMA was a great experience for the Athletic Training Students to educate the public on their future profession and also an avenue for our students to interact with students from other Athletic Training Programs. Members from PATS celebrated National Athletic Training Month (NATM) through numerous events that took place throughout across a variety of different venues within the state of Pennsylvania. The theme of National Athletic Training Month 2016 was "A Safer Approach to Work, Life and Sport. As in typical PATS fashion the organization provided creative ways to promote the profession of athletic training through public awareness and education. Below highlights a few of the many events that Athletic Trainers and Athletic Training Students participated in to endorse and promote the profession. The Pennsylvania Athletic Trainers’ Society sponsored an event that required video submissions to describe the athletic training profession, focusing on the athletic trainers serving as experts in the evaluation and management of concussions and how the PATS organization is on the forefront of concussion education for athletes, parents, coaches and physicians. The advertisements were broadcast on PCN during the High School Wrestling, Boys/Girls Basketball, and/or Boys/Girls Diving Championships in March. King’s College’s video placed first, while California University of Pennsylvania placed second, and Central York High School was chosen third. All contest participants commercials are available on PATS YouTube channel. A group of PATS members traveled to New York City to kick off NATM by standing outside The Today Show at Rockefeller Plaza & Good Morning America in Times Square. The members, students and faculty from East Stroudsburg, Temple, Lock Haven, West Chester, Eastern and Immaculata created signs recognizing NATM and the slogans promoted by the National Athletic Trainers’ Association. 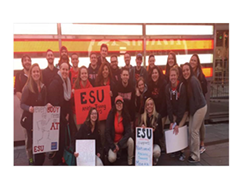 East Stroudsburg University Professor Marguerite Carver stated “In the beginning of March, we spent time in the classroom discussing the importance of promoting the profession of Athletic Training. Traveling to GMA was a great experience for the Athletic Training Students to educate the public on their future profession and also an avenue for our students to interact with students from other Athletic Training Programs. The event gave the student a sense of pride in both their profession and school.” Professor Carver most memorable aspect of the morning was when an onlooker from the crown shouted something with regards to Trainers, and Robin Roberts corrected the individual as to the proper professional title of Athletic Trainer. As part of NATM, PATS distributed over 30 banners to NATA Safe Schools in Pennsylvania to be displayed at their school about concussion education offered through PATS. The mission of this project was to recognize our NATA Safe Schools' and the Certified Athletic Trainers who contribute in providing these highest safety standards to the student athletes. In addition, PATS also posted pictures of the ATs with their banners on their Facebook and twitter pages so people around the state can view them. The goal of incorporating these pictures on social media was to encourage others schools to become Safe Schools. In order to achieve Safe Sports School status, athletic programs must complete a number of key elements that promote the upmost health and well-being of the student-athlete. To learn more about becoming a NATA Safe School please refer to https://www.nata.org/advocacy/youth-sports-safety/safe-sports-schools. In addition to the banners, PATS embarked on a billboard campaign that not only promoted NATM but also served to education the public on concussions. The billboards, both digital and poster, were placed in 20 locations throughout the Commonwealth. In conjunction with NATM, Pennsylvania Athletic Trainers’ Society also began an iHeart radio campaign. Two different Public Service Announcements (PSAs) was aired on 20 different radios stations stretching across the entire Commonwealth of Pennsylvania for an impressive exposure of 1885 PSAs. The first PSA was a 15 second radio broadcast that endorsed the expertise athletic trainers offer to athletes. This PSA promoted athletic trainers’ proficiency in the evaluation and management of concussions, and also directed listeners to the gopats.org website to obtain more information. The second PSA, 30 seconds in length, offered tips specifically from athletic trainers on how to avoid injury and illness in order to promote a safer approach to work, life, and sport. These tips included injury education, concussion awareness, and how athletic trainers can specifically help to promote this healthy and safe approach. PATS president John Moyer wrapped up Athletic Training Month by presented a 1- hour Web Chat alongside Joanne Ploch from Sports Safety International (SSI) and Dr. Franks from Pennsylvania Medical Society (PAMed) on the proper care and management of concussions. The presenters also directed participants to the specific educational opportunities that are available to the public. The Pennsylvania Athletic Trainers' Society (PATS) utilized funds they received from a grant provided by the Pennsylvania Department of Health, to work collaboratively with the PAMed and SSI to provide free concussion education throughout the Commonwealth for physicians, physician assistants, coaches, parents and athletes participating in youth sports.